This test is performed using the latest state of the art Echocardiography Technology. The system offers first class imaging, Spectral Doppler and Colour Doppler with advanced software to give ultra high resolution, digital images and post processing measurement facilities. How does it work? How will it help my GP to advise on the correct treatment? Do I need to do anything before the test? What happens at an Echocardiogram scan? What happens after the test? This test uses an ultrasound beam (similar to that used to examine a baby in its motherâ€™s womb) to image the heart as it is working within the chest cavity. It does not involve X-rays, is safe and painless. 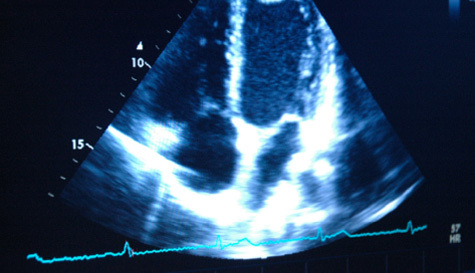 Ultrasound waves pass from the probe into the tissue and are reflected back as echoes that are detected and imaged on a monitor showing the hearts internal structure. This will allow your GP to have information about your hearts pumping chambers and valves from outside the chest wall. It is a painless test and no needles are involved. Ultrasound does not use radiation or x-rays. There are no risks associated with an Echo and it can be safely performed on adults, children and babies. There is no risk to unborn babies. How will it help my GP to advise on the correct treatment? Echocardiography provides invaluable information on the size of heart chambers, the function of the heart muscle and the working of the heart size. It is a useful test in the investigation of high blood pressure, examining the heart after a heart attack and in defining the cause of breathlessness. It will also show if heart murmurs (the noise of blood going through the heart) are due to abnormalities in the heart valves. No. You may eat and drink as normal before the test. You may also take any medications as normal. What happens at an Echocardiogram scan? The test will take place in a private room. You will be asked to undress from the waist up and will be offered a gown. You will then need to lie on your left side, on a couch. Lying on your side will allow the Technician to obtain good images of the heart. The room is often in semi-darkness to make it easy to see the pictures. The Technician will put some clear jelly on the front of the chest, then place an ultrasound probe on your chest wall, you will feel firm pressure, but no pain or other discomfort. The probe is moved to different parts of the chest to image the heart from different angles. The test usually takes approximately 20 minutes to perform. You will be able to leave as soon as the test is completed. The Technician will prepare a recording and a report of the echocardiogram ready for the Consultant Cardiologist to review. Your own GP will receive the report and will discuss the result at your next appointment.